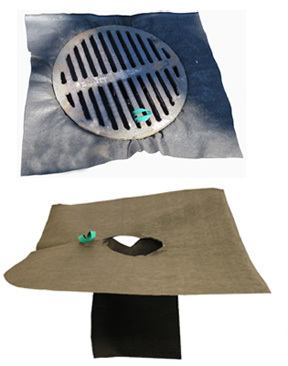 The Wireless Drain Web is a simple device designed to fit most catch basins. Held in place by the metal grate, it effectively reduces coarse sediments, oil, grease, litter and debris from stormwater. Collar is 36"x45", the bag is 22" deep, the opening is 10" in diameter. Material is an 8 oz nonwoven geotextile. A pull-strap enables user to secure the unit for removal prior to removing the grate. Excess fabric may be trimmed away. Shipping rates are estimates only and may vary due to daily fuel surcharges. Based upon data available to EnviroMet, this product is not hazardous under OSHA Hazard communication (29 CFR 1910.1200). Flash Point: Greater than 315 Deg C (600 Deg F). Auto Ignition Temperature: Greater than 550 Deg C (1022 Deg F). Fire and Explosion Hazard: Material will not burn unless preheated. Overheated or molten material may burn slowly with dense smoke. Avoid inhalation of vapors. Eye Protection: Not normally required unless physical contact with eyes is likely, or if exposed to molten product. Protective Clothing: None specified for normal use. Avoid contact with burning or molten product. Engineering Controls: None required for normal use. Work & Hygiene Practices: None require for normal use. Containment Techniques: Practice reasonable care and caution when handling product. Clean Up Procedures: Practice reasonable care and caution during clean up and disposal of material in accordance with local regulations. Other Emergency Advice: Avoid inhalation of vapors if material is burning. Store away from oxidizing materials. Storage: Store away from oxidizing materials in a cool, dry place with adequate ventilation. Hazardous Decomposition Products (from burning, heating, or reaction to other materials): Carbon Dioxide, Carbon Monoxide. Hazardous Polarization: Will not occur.